UCL, one of the world's leading universities, has set out an ambitious programme of investment in its central London estate signalling plans for continued growth over the next 10 years. 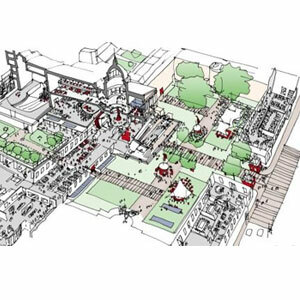 The UCL Bloomsbury Masterplan, which is published today, sets out a vision for the long term improvement and development of the UCL core estate in Bloomsbury London WC1, to support the University's academic mission through the imaginative and effective use of its buildings and public spaces. At a time of huge pressure on resources across many sectors, and particularly in Higher Education, the Masterplan signals a high degree of confidence and ambition in the plans to develop UCL, with expected investment of around £500 million in its Bloomsbury campus over a 10-15 year period. The Bloomsbury Masterplan sets out a strategic framework for the development and improvement of our estate over the next 10-15 years. The Masterplan, the result of an intensive planning and consultation process led by UCL's Estates division and leading architecture practice Lifschutz Davidson Sandilands, identifies the constraints on expansion in Bloomsbury and proposes that a new campus could be created elsewhere in London to provide world class education and research facilities. Professor Malcolm Grant, UCL President & Provost said: "The Bloomsbury Masterplan sets out a strategic framework for the development and improvement of our estate over the next 10-15 years to ensure UCL's fine buildings in the heart of this great world city best support the University's highest academic standards. "The fact that we are setting out such an ambitious programme of investment and renewal in these straitened times illustrates our global ambition and confidence in the future." Alex Lifschutz, Director, Lifschutz Davidson Sandilands, said: ''Taking a diverse set of buildings, built up by the university incrementally over the last 185 years, and developing a plan to make this estate worthy of a great institution for the 21st century has been a challenging task. To our delight, it turns out that much of UCL's stock is rather fine and capable of adaptation to contemporary and future uses. Increasing the quantum and quality of space for teaching and research; with the Estate having developed organically over the past 185 years, and much of it having listed status, the Masterplan outlines strategies to deliver on the huge opportunities for better use of space and improved circulation across the campus. The approach is nimble and sustainable, relying on innovative ways of using existing buildings for new uses. The masterplan anticipates future change with its loose fit strategy - thus buildings are not to be locked into current functions but capable of adaptation using a standard kit of parts. To open the campus up to the public, world-class museums and collections will be relocated to key perimeter points, signs and way-finding improved and the ground floor of academic buildings opened up so that the activities are more visible and more accessible. A new Student Centre on a site adjacent to the Bloomsbury Theatre on Gordon Street is proposed. This will bring together many of the student-focused functions currently spread over the site. This is the only significant new building proposed In the Masterplan. The Masterplan establishes long term strategies for improvement and identifies up to 100 projects for investment over the next 10 - 15 years likely to total around £500 million. A first phase of projects have been identified and is now being progressed. The Masterplan builds on significant investment in the UCL estate, with capital expenditure over the last five years totalling over £200 million. To support the emerging investment programme, UCL is reviewing its consultancy frameworks and has this week published a procurement notice in the Official Journal of the European Union seeking interest from professional consultancy companies to support a wide range of construction and estates related projects to develop, maintain and improve the UCL Estate.